While boilers aren’t commonly used for new homes in Minnesota, there are still plenty of houses in Minneapolis and Saint Paul that rely on boilers for heat. 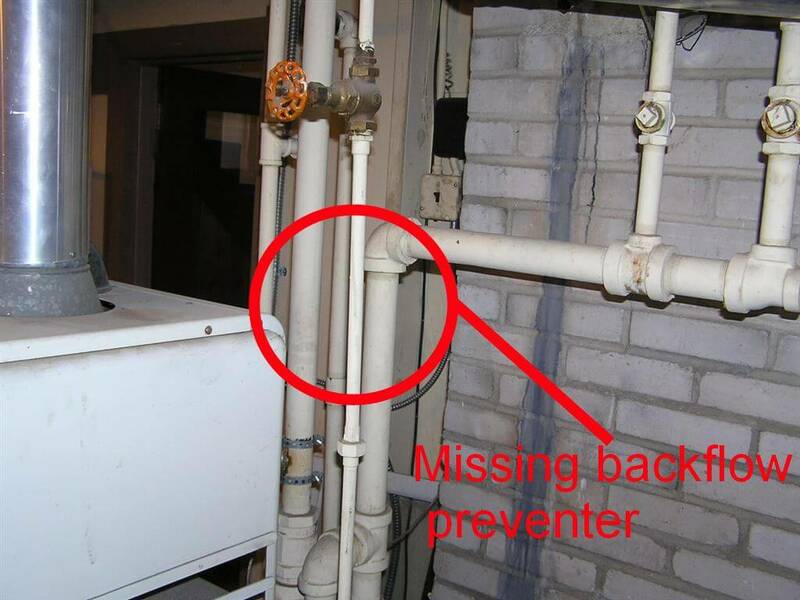 For Minneapolis homes that have boilers, the most common required repair for Truth-in-Housing Evaluations is a missing or improper backflow prevention device installed on the water line that feeds the boiler. This repair also requires a permit. The photos below show improper installations that would require repair. Click on the photos for a larger version. 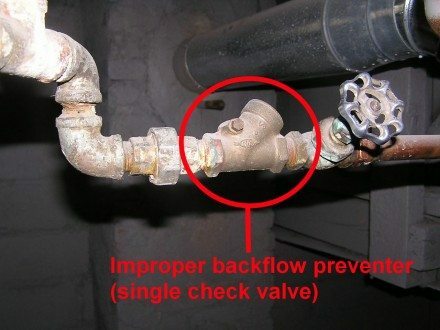 Backflow preventers are needed on boilers to prevent the water that flows throughout the radiators from potentially mixing with the city’s potable water supply and contaminating it. In Minnesota, the minimum type of backflow prevention device required for a boiler in a one or two-family home is a Double Check Valve with an Intermediate Atmospheric Vent (DCVIAV). These are often referred to as “9D Valves” because Watts makes one of these valves, and their part number is 9D. You know you have the market cornered when everyone calls the product by your part number, right? 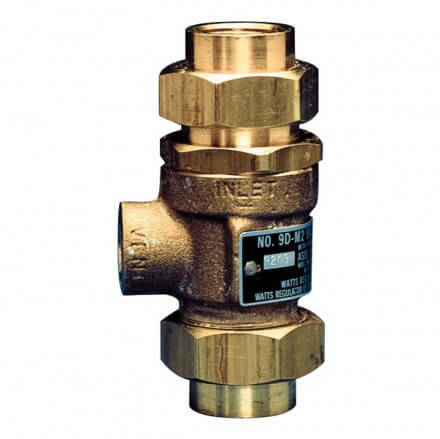 These valves are special because they’re almost 100% fail-safe. Even if both of the internal check valves were to become fouled and stuck in an open position, the vent would still prevent any water that was subject to backpressure from potentially contaminating the potable water supply – this water would just leak out of the vent. Because the vent has the possibility of leaking water, most plumbers will install a pipe off the vent to direct water to a location where it won’t cause damage. This is also part of the installation instructions for these valves. For anything other than a one or two-family home, Minnesota requires a Reduced Pressure Zone (RPZ) valve on the water supply for the boiler. These are also required when any chemicals are added to the system, such as glycol. RPZ valves must be tested every year, and must be re-built every four years. For a full list of the types of backflow prevention devices required in Minnesota, click here https://www.revisor.mn.gov/rules/?id=4715.2110 .